You are here: REDWOLF > Home > News >News Detail - Systema REVOLUTION Gearbox breaks performance boundaries! RedWolf Airsoft Specialist is thrilled to present one of the most exciting new products for the year 2008 from SYSTEMA. We received one of these working prototypes from Systema this month, and have been very impressed with the response and performance of this incredible new design. For those unfamiliar with this famous company, Systema is to Marui like what AMG is to Mercedes Benz. From the masterminds of AEG upgrade technology and the creators of the Professional Training Weapon; the Revolution gearbox from Systema makes a leap to improve the AEG operation by deriving PTW technology into a shell, that drops right in the place of your obsolete Version 2 gearbox. Featuring a revolutionary (pun intended) design free of sensitive parts like the tappet plate, cut-off lever and anti-reverse latch, this computer controlled piece of intelligent engineering is really racing to develop the breed. The gearbox of the Marui Man from 1991 is ready for a well deserved retirement! You can now turn your traditional Marui-design automatic electric gun into an economical version PTW! On a quick glance, the Revolution looks very much like a V2 gearbox. 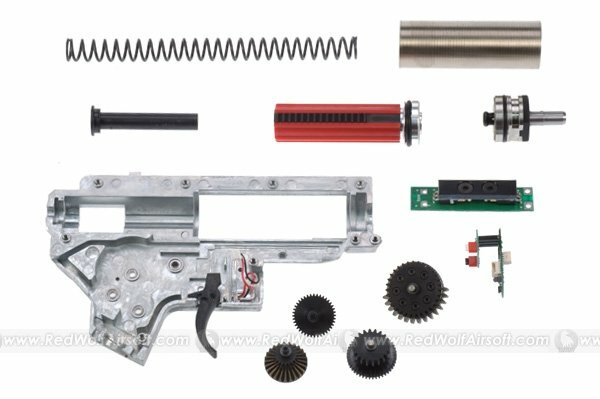 Scheduled to be released in time for the summer season of 2008, the Systema Revolution gearbox is the future top-tier solution for upgrading an AR-15 type AEG that uses a Version 2 gearbox. The Revolution is a drop-in fit for the Tokyo Marui M4/M16 series, and will fit most other brands as well, provided that they are made to a high enough standard and measurements close to Tokyo Marui. As with the traditional full gearbox upgrades from Systema, we are not expecting any issues using this with G&P and Classic Army receivers. ICS will not be compatible, due to the split design and modified receiver dimensions. After removing the right half, the differences become obvious. Compatibility with the V2 gearbox stops at the surface. 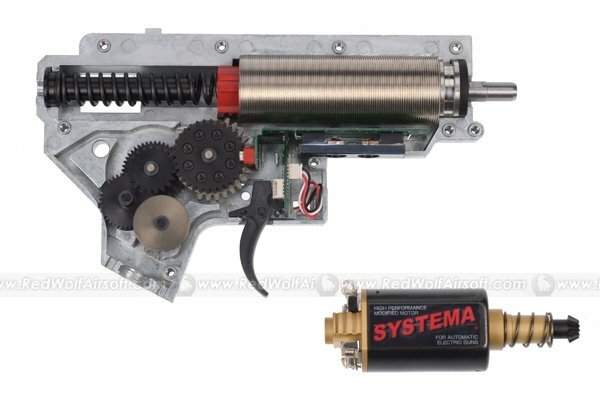 The Systema Revolution gearbox mimics the V2 on the outside so it can be used with the common AEG, but an entirely different heart is beating on the inside. Note the extra beefy walls of this near gearbox, which is designed to withstand high powered springs for mind-blowing power levels unseen in traditional Marui-type guns. An ingenious trigger unit called the E.C.U. is integrated into the Revolution. As the trend is with high performance electric guns, the design uses MOSFET components to allow a smooth flow of electrons from the battery to the motor, and eliminate arcing and high currents from the trigger unit. Instead of a mechanical cut-off lever, the E.C.U. has an optical sensor to detect the movement of the sector gear at all times. First of all, the optical sensor allows the factory-programmed chip to make the gun shoot once on semi, and once only. Even a quick tap on the trigger activates the cycle, which doesn't leave the spring half-cocked like a traditional AEG does. This feature was exclusive for the PTW, but now it is available for AEG users as well. Because the E.C.U. "knows" the position of the gears at all times, it will always stop the firing cycle in the same spot. Adding more current or active braking (by reversed polarity) when necessary, the E.C.U. keeps the shooting cycle consistent shot after shot. This allowed to omit another small mechanical part, namely the anti-reversal latch. Less moving parts translates to fewer mechanical problems! The E.C.U. makes a proper three round burst possible as well, instead relying on complex mechanical parts or an inconsistent timer system as seen in older designs. As with real firearms, the burst stops as soon as the trigger is released, even if three rounds were not fired at that point. In fact, this circuitry can allow programming any number of rounds to be fired automatically on each trigger pull. So a 6 or 7 round burst is possible though it's not clear at this point whether Systema will make that user programmable.! The second piston tooth is lowered to ensure a positive mating of the sector gear and piston teeth. The piston features a full steel tooth rack in a solid polymer body. The tappet plate is one achille's heel of a traditional AEG gearbox design. Why reinforce it when you don't even need one? Pioneered with the PTW, the Revolution gearbox has a new nozzle design; the loading movement is achieved with a flexible fit to the piston head. This makes the nozzle movement linear, and eliminates the old fragile part from the equation entirely. The nozzle is pulled back and released from an O-ring within the piston head as the piston moves. As a fine side-effect we expect the gearbox to be even more durable in the front, compared to the reinforced V2 gearbox. The piston is considered to be the "consumable" part in any AEG. With the Revolution, this is addressed again with a PTW-style solution. By reducing the spring diameter, Systema achieved more freedom in the design of the piston. It is now an enclosed polymer part with an all steel tooth rack below, while other metal tooth piston designs have been open from the "belly" to allow sufficient space for the tooth rack. As a result the spring does not rub against metal, and the tooth rack stays on under the load of even the strongest springs. An in case you were wondering, this is not the traditional red cylinder offered by Systema in the past for regular gearbox upgrades. 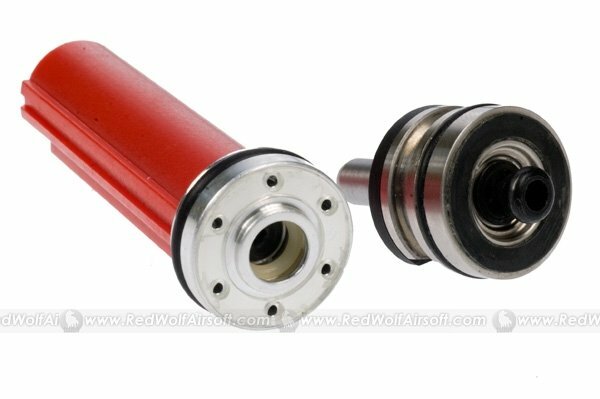 This is the same super strong piston (which also happens to be red color) used in the PTW MAX guns. 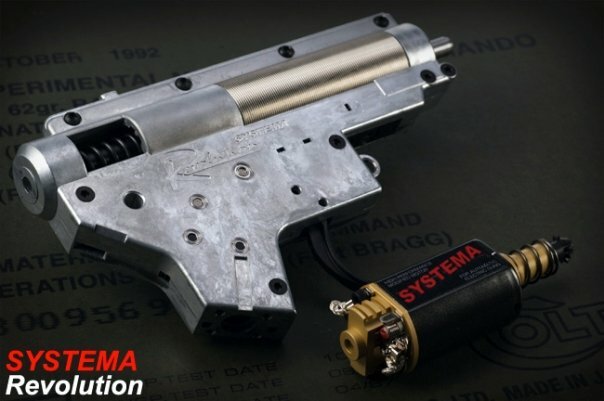 As the gearbox was improved so far ahead compared to a traditional design already, Systema decided to make the gear train their way, instead of reinforced parts following the Tokyo Marui form. The gear train consists of four gears to transfer the power from the motor to the piston. The sector gear has a slightly larger module (tooth size) to engage the piston, and is fitted with 7 mm bearings for strength. Two spur gears and a bevel gear are machined to tight tolerances with a smaller module to reduce gear noise and improve efficiency. These three gears are supported by two 6 mm ball bearings each, and allow a wide range of gear ratios to be developed later on. As the piston starts to retreat, it pulls the nozzle back. The spring-loaded piston head provides a slight delay to the release. 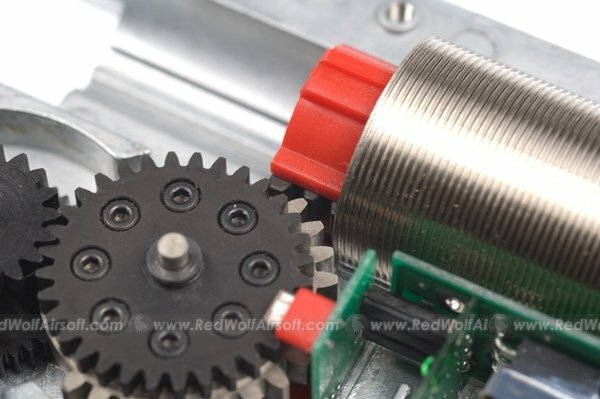 Because of the additional gear in the gear train, the motor was redesigned to run in reverse. 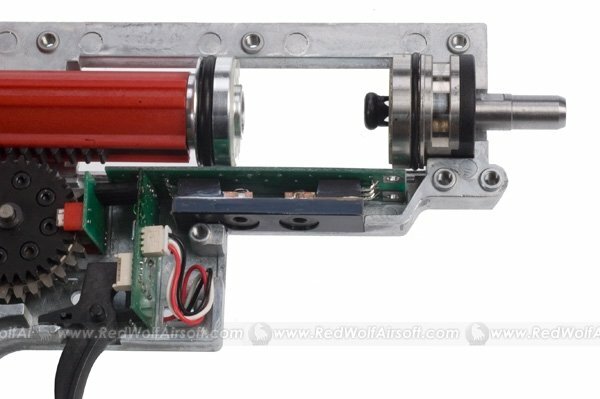 While a DC motor would turn the other way simply by reversing polarity, it will not give peak performance in the "wrong" direction. The motor of the Revolution gearbox features superbly strong Neodymium rare earth magnets, ball bearings, a steel pinion and hand-wound armament for the highest performance money can buy. Brought to you by RedWolf Airsoft, you can count on us for the latest information regarding the Systema Revolution. Please check our home page regularly for updates! Pricing for this revolutionary gearbox has not yet been set yet but check back for more information as it becomes available from Systema. RedWolf Airsoft is the official distributor for Systema in Asia, UK and parts of Europe. 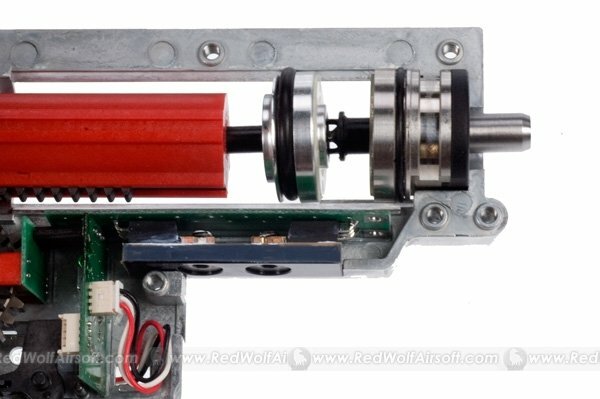 The gearbox has a surprisingly small amount of mechanical components. All parts are the highest quality you can hope to get. 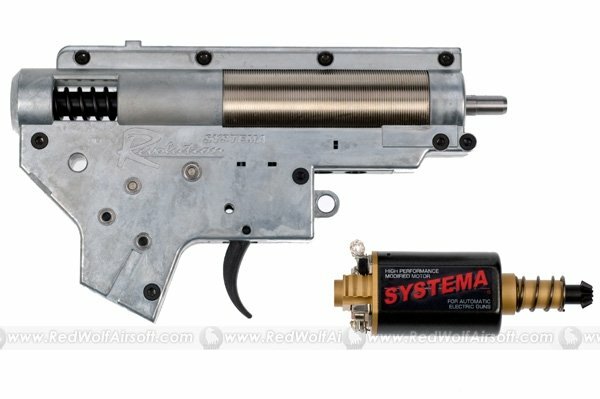 For additional reading, you may want to check out our buddies at Zshot.com (Systema Distributor USA) who have a rather nifty page about the Systema Revolution gearbox here and have a FAQ page here.